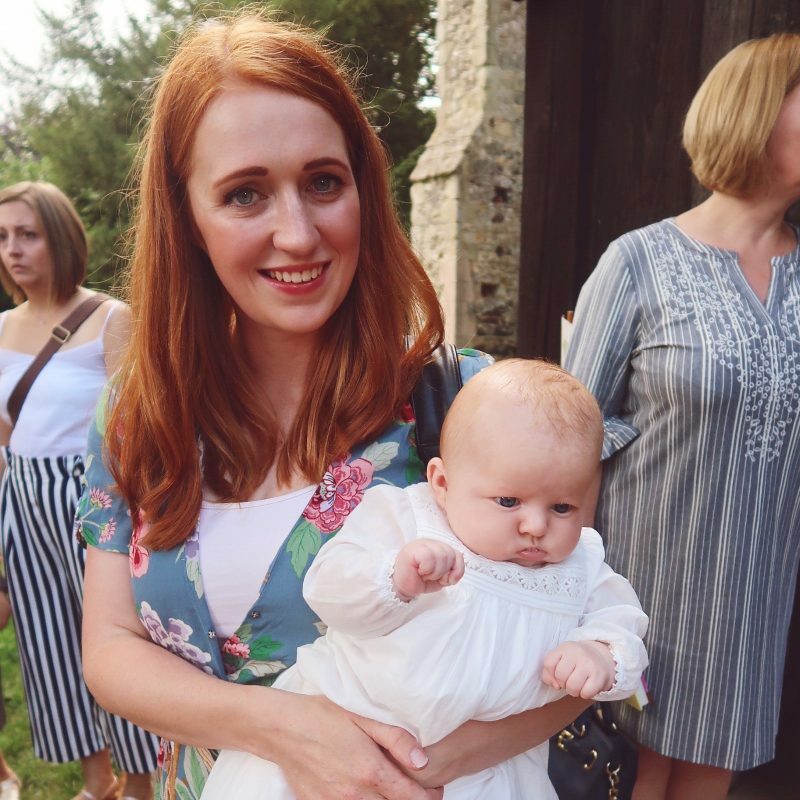 Like many parents I am always trying to save money as much as possible on things like nappies, wipes and the never ending provision of snacks that are required for a toddler! 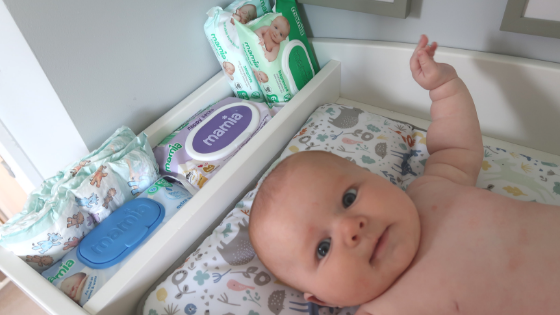 So when Aldi contacted me to ask me to try out their Mamia range, I was all over it! I regularly shop in Aldi, and the Mamia range has seen me through the past 2 years of parenthood. So I was more than happy to share my opinions on it with my readers! Aldi stock a good range of baby products in their Mamia range. And during their baby events they stock even more! Their everyday range has all you need for change and meal times. Their products are always great quality, very reasonably priced and their food products always taste really good. 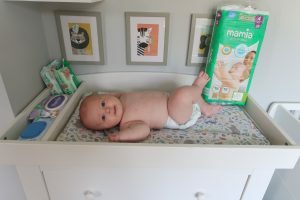 Henry has been using Mamia nappies since he was a newborn, and we had shaved the £’s off of our nappy bill. Their size 4 nappies are just £2.89 for 48 nappies or £4.39 for 84, which I’m sure you will agree with me is a lot cheaper than branded nappies and I find they are just as good. I’m also really happy to tell you that they have now started stocking their Ultra Dry Easy Pants in a size 4 as well (£2.04 for 22), perfect for those little wrigglers! And to dispose of those stinky nappies I’ve always used the Aldi Mamia nappy sacks which are nice thick bags and at 85p for 150, are a total bargain. The Aldi Mamia wipes are really great quality, you can get several different types of wipe. They have a variety of different wipes the fragranced wipe (49p), the sensitive (49p) and the extra sensitive (65p). The extra sensitive wipes are new to their range and are made from 99.5% naturally derived ingredients and contain 0% perfume or alcohol. This means they’re pH skin neutral. So they’re basically as close as you can get to using cotton wool and water, but in wipe form, meaning they can be used on newborns. They’re dermatologically tested, hypoallergenic and paediatrician approved. And another great thing; all of Aldi Mamia’s wipes are endorsed by the Skin Health Alliance. Another product I love from the Aldi Mamia range are their toddler wipes. 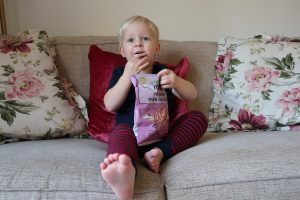 Since potty training Oliver, I’ve been using their toddler wipes because they are so inexpensive at 55p a pack, compared to other brands on the market! And the quality is just as good, if not better! And to be honest, you don’t want to be spending loads of money to wipe your child’s bum! Aldi’s Mamia range of food and snacks are perfect for all stages of weaning. They have a variety of different meals, starting with the Stage 1 going through to Stage 4. As well as also stocking a variety of finger foods, like rice cakes and carrot sticks (all which are much loved by Oliver!). I love that their baby and toddler meals are so reasonably priced and they’re all organic. They must be loved by parents all over the country as they were named Best Organic Baby Food at the Loved by Parents Awards 2018! They’ve recently brought out a few additions to their range of baby food. First up their fruity pouches are launching two new multipacks which at £1.99 for 5 pouches is a great deal. They also have two new flavours in their Stage 2 pouches, cheesy pie & vegetables and lamb and vegetable. These pouches are only 55p each so a lot cheaper than their branded counterparts! Their new Stage 4 meals come in 4 different flavours, Beef Casserole, Spaghetti Bolognese, Tomato & Mozzarella Spaghetti, or Chicken & Vegetable Risotto and they’re only 95p! 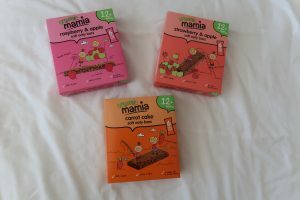 For an on the go snack, they’ve recently launched their Mamia Organic Oaty Bars. They come in 3 different flavours Carrot Cake, Strawberry & Apple or Raspberry & Apple. These are perfect for keeping in my bag for Oliver to snack on whilst I’m out. At £1.29 for a box of 6 they’re very reasonably priced. All in all I’m very impressed with the Aldi Mamia range. It’s great quality, great value and all importantly a great price! There’s no need to spend a fortune on your child’s everyday essentials anymore. The fact they’ve already won 46 awards this year proves that they really are one of the nations favourite brands. Have you tried the Aldi Mamia range? I would love to hear what you think about it! This post was in collaboration with Aldi. All words and opinions are my own, I genuinely love the Mamia range!